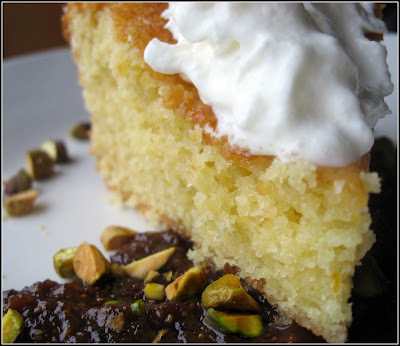 Fluffy cake made with Meyer lemon juice and zest, served with a fig puree, pistachios and whipped cream. Preheat oven to 350 degrees F. Grease and flour an 8-inch springform cake pan. In a medium sized mixing bowl, sift together flour, baking powder, baking soda, and salt. In a large mixing bowl, using an electric mixer on medium speed, beat together butter and sugar until creamy, about 1-2 minutes. Beat in vanilla, lemon juice, lemon peel, and yogurt, until well combined; gradually beat in eggs until combined. Reduce mixer speed to low, and gradually beat in flour until combined. Scrape batter into prepared pan, and smooth with a rubber spatula. Bake at 350 degrees F, for 35-40 minutes, or until golden brown, and a toothpick inserted into cake comes out clean. Cool cake on a wire rack, completely, before slicing. Serve with fig puree and a sprinkling of pistachios. *To make the fig puree, melt the butter in a small saucepan, over medium heat. Whisk in water, lemon juice, brown sugar, and amaretto, until well combined. Whisk in figs, and cook for 6-8 minutes, or until figs are plump and moist. Transfer fig mixture to a food processor, and process until finely ground. 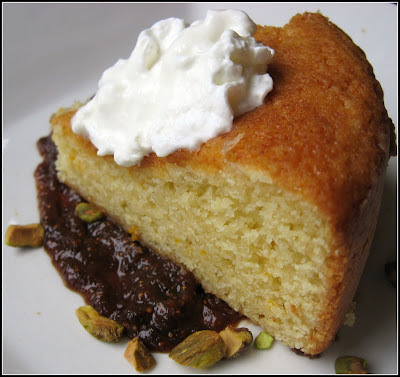 45 comments on "Meyer Lemon Cake with Fig Purée and Pistachios"
i completely know what you mean about wal-mart--i avoid it if at all possible. it's like once people cross through the sliding doors and into the store, they become frantic and rude (often using their carts as weapons). no thank you. anyway, your recipe is, as usual, amazing. it definitely qualifies as "a taste of spring." good luck in the challenge! Em- This really looks incredibly delicious and the added fig puree with pistachios mmmmmm Beautiful work! How cool to find Meyer lemons! They are so great for lemon desserts. The thing that amazes me at Wal Mart is how they have like eleventy-seven check out lanes and only 3 or 4 open, even at peak times. You made a wonderful recipe with them for sure. Good luck on the contest! It looks really really good. The figs and the lemon are perfect together. Thanks for the reminder about the clocks. Damn, I hate this day. I haaaate Wal Mart. Not the people but the stores always seem so sad and dingy. And there are always long lines at the checkout, which almost never happens at Wegmans. But I love your lemon cake. It looks so moist and delicious. That lemon cake looks really good. I like the use of the fig and pistachio sauce. I have yet to try a Meyer Lemon. I've discovered your blog just recently and I LOVE it. I've also recently fallen in love with Meyer Lemons... I blogged aobut a Meyer Lemon Loaf and a Meyer Lemon Curd recently. Good stuff, eh? We don't have any of those WalMart grocery stores here, but I did find them in another market. Beautiful! Looks very yummy. I love the fig/pistachio/lemon combination. Emi, you know the world's gone mad when Wal-mart will carry fresh figs. The cake looks moist...I'll have a short espresso with that pease! 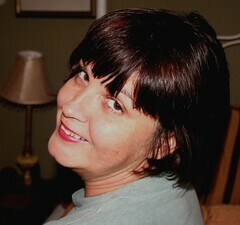 I hate Wal-Mart - I only go if it's either really early in the morning or really late at night - can't stand the crowds. I finally found some Meyer lemons (but not at Wal-Mart). I read that they turn more orange the riper they are. Who knew you could find meyer lemons at walmart??? I still have to find some and use them before the season is over, I have yet to do so. Uh, yeah, apparently Daylight Savings Time was working in "Stealth Mode" this year - because I had no clue until I woke up this morning and booted up my computer. Whoops. This cake looks great, btw -- I haven't been able to get my hands on any Meyer lemons, and I'm jealous! Emiline, in Greece the time will change the last Saturday of March. I love figs and your cake looks so nice and moist. Good luck in the challenge. That fig puree with the pistachios is the icing on this cake! Just perfect emiline. That looks soo yummy! The cake looks really moist! I'm very impressed - what great flavors! Gorgeous cake Emiline!! Very gourmet indeed. Looks scrumptious! I've got some massive lemons I need to use up. Have a great week! i had no idea that was what a meyer lemon is!! how cool. So we're all in agreement? We hate Wal Mart? And they're incredibly low prices. That cake looks wonderful! I have never made a lemon cake before and the crumb on that looks perfect. I can not wait to try this recipe. Oh my goodness, I love figs, pistachios, and lemon... you managed to incorporate all three into that magnificent dessert!! Yum!! I read the words "lemon", "fig" and "pistachio" and was instantly in heaven. Yummo!!!! Good luck with winning the Tupperware. Wal Mart is jank. But truth be told, people lacking "personal space consciousness" is not limited to Wal Mart. One time I was tryna enter my PIN in the debit card thingy at the grocery store and this guy behind me would NOT stop breathing down my neck! I was like "EXCUSE me" and he was all "you're excused." WTF? If people are closer than an arm's length, that is just too close. Oooh Emiline this looks awesome! Finger crossed spring will soon arrive. 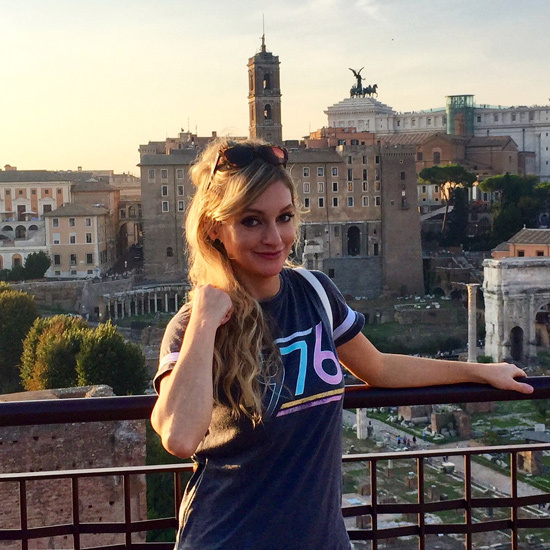 I love the new blog - I've been a bit MIA and haven't visited recently. Looks great - the header is adorable. Emiline this looks stunning - I'm very impressed!! OHHHH honey. This looks just gorgeous. Fig and lemon...what a gorgeous combination. I wish I could taste a bit! I love your cake Emiline! Pure genius - AGAIN! You are incredible, girl. And I also hate wal mart - but I am glad you found Meyers there - I was all set to buy meyers from the citrus guy at the Farmer's Market this weekend, and guess what??? It isn't lemon seasn anymore!!!!! WHAT?!?!?! And I had everything I needed to make limoncello!!!! Their, not they're. It was late, please forgive me. perfect timing! i just found meyer lemons a couple of days ago, and they're sitting on my counter waiting for me to think of the perfect thing to do with them. Em, I with you on the Walmart experience. I too went this weekend. I have to psych myself up before going, in order to handle it! 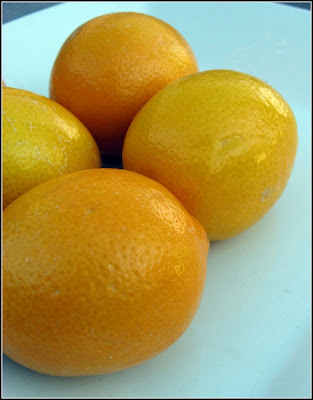 I just recently bought my first meyer lemons and I haven't tried them yet. Your recipe killed me just looking at the photo and then after reading it, I'm totally hooked. I LOVE lemon cake, LOVE pistachios and Yes LOVE figs. And lets not forget Amaretto! I have actually been trying to think of something to make with my lemons and I have some pistachios. I wonder if this would work as well with dates, which I have in my pantry closet? Emiline, this cake looks lovely! I liked it so much that I linked to it on my Meyer lemon post. I found Meyer lemons at my market the other day too. There must be a surplus this year because I've never been able to find them before. Of course, I made a cake too, but not as elegant as your! I can't believe that you found Meyer lemons at Walmart. I'm afraid to go into my mine because the greeter has a GIANT goiter. Annie- I think dates would be wonderful. I'd just watch the sugar. I don't think I'd add any sugar. Looks so lovely, i bet it is very very delicious! well done! I shop at Target. They have lots of cool stuff, but no Meyer lemons. We don't have SuperTargets here, sadly. I always grab a bunch when I see them, and hope to use them before they rot in the fridge. Oh so you got converted to meyer lemons. Congratulations! They're fantastic i agree and that's a nice use for it.